Boston Post Dairy is located on the Gervais Family Farm, a family run farm in northern Vermont owned and operated by Robert and Gisele Gervaise and 12 of their 15 children. The Gervaise family has been farming the property since 1962 when they began with 35 Jersey cows and 220 acres of land. Today they milk over 1,800 cows and grow 3,100 acres of corn and hay. In 2013 their farm was given the prestigious Vermont Dairy Farm of the Year award which yearly honors an outstanding, efficiently managed dairy enterprise that sets a strong example for other farmers to follow. Farms are evaluated on a number of criteria including production records; herd, pasture, and crop management; environmental practices; contributions to agriculture and the local community and overall excellence in dairying. Boston Post Dairy is operated by their 4 daughters and named after the old road that runs through the property. The Dairy is home to 70 dairy goats and 80 dairy cows. They make cheeses from goat milk, cow milk, and a blend of goat and cow milk. Très Bonne is French for ‘very good’ and it is. 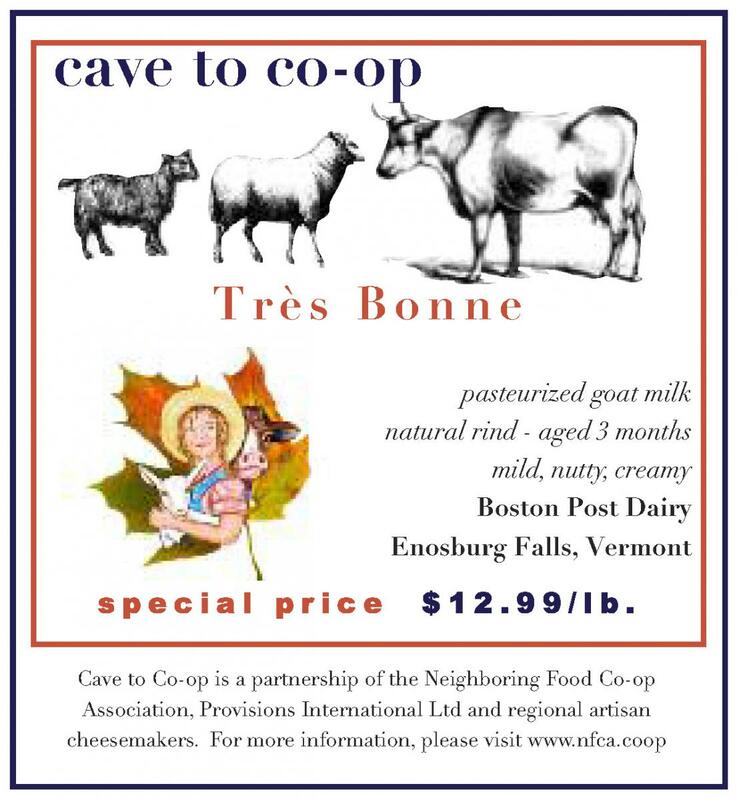 An ACS award winning cheese, Très Bonne is aged 2 to 5 months and has a fresh, mild, nutty flavor. A favorite with the entire family. Brush one side of each bread slice with oil and arrange oiled side up on a baking sheet. Bake for 10 minutes, until golden. Rub the toasts with the garlic cloves, then rub with the tomato halves until all of the flesh is gone; discard the tomato skins. Season the toasts with salt and pepper. Top with cheese, drizzle with olive oil and serve. In a large nonstick frying pan, heat 2 ½ tablespoons of the oil over moderately high heat. Season the eggplant with the salt. Fry one-third of the eggplant, turning, until golden, about 10 minutes. Remove. Repeat in two more batches with the remaining oil, using more if needed, and the eggplant. Meanwhile, oil a 14-inch pizza pan or large baking sheet. Press the pizza dough onto the pan in an approximately 14-inch round or 9-by-13-inch rectangle. Arrange the eggplant slices on the pizza crust. Sprinkle the garlic and pepper over the top. Bake for 12 minutes. Put the slices of cheese on the pizza, sprinkle with the Parmesan, and then dot with the pesto. Bake until the cheese begins to turn golden, about 15 minutes. Serve in wedges. Arrange cheese and nuts on a small platter. Drizzle the Parmigiano Reggiano with honey, slice the fruit, place the preserves in a small bowl and serve with crackers or baguette. Perfect!